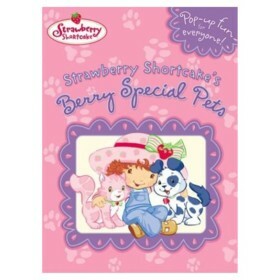 Strawberry Shortcake's Berry Special Pets is a book in the Children genre written by Those Characters From Cleveland. The book was published by Grosset & Dunlap on 2004-10-07 and contains 10 pages. The book has an ISBN number of 978-0448435152. Our users found the overall impression of this book to be Happy. My brother purchased this book for my daughter's fifth birthday. The book appeared very interesting at first as it contained pop-up pictures of the pets of Strawberry Shortcake and her friends. My daughter loves the graphics as they are all very colorful and because she really loves animals as well. As a parent, I found the actual content of the book rather disappointing. The book devotes two pages to each of the pets, but all it does with this space is tell you her friends name and the name of her pet. For example, heres a quote from the book - “Apple Dumplin' loves to play with her pet, Apple Ducklin'”. And that's it – no educational content at all. They could have used the space to describe ducks in general – their color, their webbed feet, that they swim, etc.. Sure, the pictures of the animals are great and my daughter loves them, but I would have preferred some more content. Also, some of the terms that my daughter may pick up while reading this book are rather odd - “Apple Dumplin'” and “Apple Ducklin'” are hardly useful terms to learn. Overall, the graphics and the pop-ups are great, but if you are looking to actually teach something to your child then you would be better off looking elsewhere. If instead, your child is very, very, young, then the wonderful drawings should be enough to keep them occupied for at least for a little while :).